My son Felix is 11 years old. You've probably seen him featured here on the blog or on Instagram if you're a regular reader. I have written previously about a little parental thing I have going on with my kids. I've never wanted to influence them unnecessarily regarding such things as our transport habits or recycling garbage or other such things that are part of our daily life. Despite my work at Copenhagenize Design Company, I don't bang on endlessly about how important it is to ride a bicycle in cities and how driving a car in cities is a hopelessly old-fashioned and irresponsible act. Cars simply never enter into the conversation. We don't have one and my kids only spend about five hours a year in a car so there is really no need to discuss them. They are simply not part of our life. Nor do I talk about bicycles. I'm not some bike geek so I don't talk about how great bicycles are, how bicycles can save the polar bears, cure diseases like malaria or chlamydia, blah blah blah. We just ride them. I just make it normal for them. Kids don't want to be perceived as being strange or different in their social hierarchy. The same applies to recycling. The city in which we live makes it possible for us to dispose of our garbage in great detail in our backyard. I don't think I have ever said to my children why it is important to recycle. I just tell them to take out the garbage and to remember to put it in the correct containers. It's normal. Do it. When they get older, I may fill them in about it. I think it has been a good strategy for the kids and their perception of what is normal, right and sensible. With all that said, Felix at the age of 11 has picked up on a few things. He's at the age where he knows a lot more about what his dad does for a living and the intellectual nature of our conversations has increased - like it does with all kids that age. Now, we can have great conversations about urban planning and the kind of city that we want to live in. I cannot avoid the fact that he is influenced by me and the work that I do but I try to encourage him to make up his own mind about things. He is inquisitive and often asks more and more questions about what I do. As I write this, he is in the fifth year of school. It was about two years ago that I started to realise the potential of children in the field of urban planning and city life. A couple of years ago the Bicycle Innovation Lab, the first cultural centre for cycling in the world which I was involved in founding, put on an exhibition called The Good City. The goal of the exhibition was to allow a group of different people and organisations the opportunity to envision what The Good City should and could look like. It was written between the lines that bicycles, inevitably, were involved in the development of The Good City. As I have said many times before it's not all about the bicycle. The bicycle is merely the most powerful tool at our disposal in our urban toolbox for creating liveable cities. Or as we like to say here at Copenhagenize - Life-Sized Cities. The result of the exhibition was a fascinating array of interesting and sometimes visionary proposals about The Good City. Copenhagenize Design Company was one of the participants in the exhibition along with architectural firms, cycling organisations and other interested and interesting parties. I wanted, however, to throw a curveball into the equation. I enlisted the help of Felix's third-grade class and gave them a challenge. I went into their classroom and asked them, quite simply, if they thought that they could redesign the roundabout outside their school. 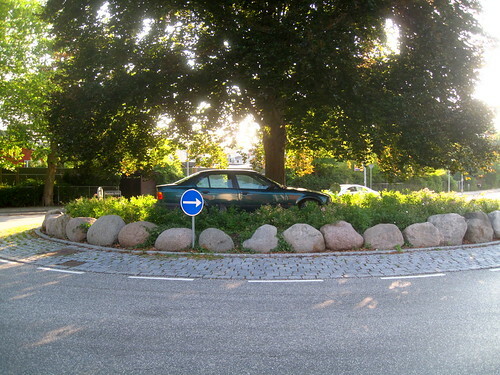 It's an incredibly badly engineered roundabout - even for Copenhagen or, more specifically, Frederiksberg, where we live. Nevertheless, it is a roundabout that all the students use at least twice a day - and often several times. I asked them to look at the roundabout and figure out how they could make it safer for cyclists and pedestrians, as well as proposing how people could get out of their cars and onto public transport or bicycles. That's it. I didn't fill their minds with anything more than that. I try to explain the challenge in the simplest terms in the hope of getting them to take up the challenge from the purest possible point of departure. They took up the gauntlet with gusto, dividing up into teams, doing site visits and talking together with the kind of passion that kids that age have. They took notes and made drawings - okay, mostly drawings - they were third-graders after all. They went back into the classroom after their field research to discuss both in their groups and as a class. Their teacher was brilliant in guiding them and keeping them on track and they brought a great many ideas to the table and the mini project culminated with them producing a wonderful model of the newly designed roundabout, made out of milk cartons and cardboard. It was a joy to behold the entire process. Since this urban planning experiment, I have done a lot more work with children, including my own, and I have developed an enormous amount of respect for their purity of thought, rationality and logical approach to city life and urban planning. As you would expect from 22 young urban minds there were a great many ideas. One of the boys suggested that all the roads be dug up and made into canals. His idea was that everybody could just buy canoes and kayaks and paddle happily about their daily lives in our densely-populated neighbourhood. Even the craziest ideas from the minds of children can be incredibly appealing and aesthetic. The boy may or may not have heard about Copenhagen's climate change fate which has brought us regular torrential rain storms that our sewer system was simply not designed to handle. More than likely, he just likes going canoeing with his family. Regarding the question of how to encourage people to get out of their cars another boy had a simple suggestion. ”Why don't we just make cars uglier? Then people wouldn't want to buy them or drive them”, he said. Again... simple and rational. They also had a long list of more concrete ideas. Without any real experience or knowledge of the finer points of speed limits, they determined that the speed through the roundabout and, indeed, all the streets around their school should be set at 15 km/h. This was one point that amazed me. When I went back into the classroom to talk with them about their solutions I asked how they knew that. How did they reach 15 km/h as a speed limit? Bizarrely, or so you might think being a school in Copenhagen, the speed limit is 40 km/h past their school. Fortunately, the roundabout is tight, so it is difficult to hit that speed. The kids admitted that they saw the speed limit postings on signs nearby but also that they observed the speeds of the cars and the bicycles. They made a guesstimate about 15 km/h being the perfect speed limit. They had no way of knowing that 15 or 16 km/h is actually the average speed for cyclists in Copenhagen or Amsterdam. Nice one. There are cycle tracks, of course, going past their school. Nevertheless, they proposed putting up a fence between the cycle track and the car lane. In order to keep people safer and to make them feel safe. They had figured out perception of safety. I was loving it. After observing the roundabout and the traffic going through it one of the groups thought it might be a good idea simply put up traffic lights instead of using the roundabout function. The reasoning was based on their experiences going to school in the morning. School starts at 8 o'clock which is also the time that most of the city seems to be heading towards work. There are crossing guards to help the children and parents get onto the school grounds but impatient motorists, almost every single day, create a tense and somewhat uncomfortable atmosphere as the clock ticks towards the ringing of the school bell. They simply thought that would force the motorists to stop and it would make it a more pleasant and less distressing experience getting into the school. Another interesting proposal from these young minds was implementing one-way streets around their school. Only for cars, of course. Most of them live in the neighbourhoods around the school and one-way streets are not a foreign concept to them but they identified it as a sensible solution around their school. Putting in speed bumps at regular intervals was also an idea on the table. Again, only on the road for the cars. To slow them down, they said. All very simple and rational ideas that could be easily implemented. They decided to conquer back the road space and put cycle tracks down the middle of the main street, relegating cars to side lanes and forcing them to come to a full stop at the intersection. It was also here that they took it one step further with their boldest idea. In a unanimous decision, they wanted to see glass roofs covering the cycle track, not only around the school but in the entire neighbourhood. They simply did not want to get wet in the rain or snow ever again on their bikes. That was something I could sympathise with. At the end of the day all their passionate work was based on rationality, logic, human experience, their personal desire lines and human need. It was then that I realised that by adopting their pure, rational thought we could very well be on the way to make a great leap towards modernising our cities and making them more liveable. Thinking like they do frees our minds. The glass roofs are a funny idea, sure. As we speak, however, rain sensors are being tested in cities in the Netherlands. Sensors that will register if it is raining or snowing or if the temperature is too cold and that will then allow for 3 to 4 times more light cycles for cyclists in order to get them home quicker through the adverse weather. In Copenhagen, the Green Wave for cyclists which has been in place since 2007, is another way of thinking simply about how to prioritise urban cycling. Ideas like these use the same simple and rational approach as the children used when redesigning the roundabout outside their school. Like I said, I have become acutely attuned to the brilliant logic of children in matters relating to my work. Sometimes, I dare say, I feel like I would prefer to work with children on our urban planning projects. It would certainly be cheaper. Hourly wages could be paid in ice cream and the occasional trip to Tivoli amusement park. As I say in my bicycle urbanism by design keynote talk, what would the streets of our cities look like if our main consultants were five-year-olds like Lulu, third graders and teams of young design students? I think they would be beautiful. They would work just as good as the working now. More importantly, they would be safer than any single point in the last century. They would be rational streets designed on the desire and mobility patterns of the citizens. Just as they were for 7000 years since cities first were formed and before we screwed up by allowing traffic engineering to dominate life in our cities.